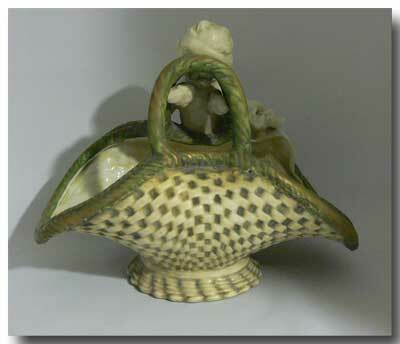 AN AMPHORA POTTERY BASKET BY RIESSNER & KESSEL, 1903-1910, TURN-TEPLITZ, BOHEMIA. 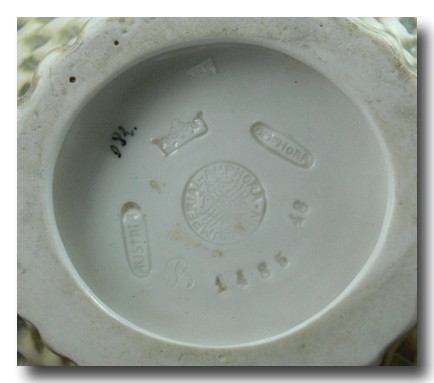 IMPRESSED MARKS FOR “AMPHORA” AND “AUSTRIA” WITHIN OVALS & THE IMPRESSED AMPHORA CROWN MARK PLUS THE “IMPERIAL-AMPHORA TURN” MARK IN A CIRCLE AND IMPRESSED NUMBERS “1485”, “48” AND A STYLIZED FAINT “R”. FINALLY A GREEN ARTISTS WRITTEN MARK OF 082. 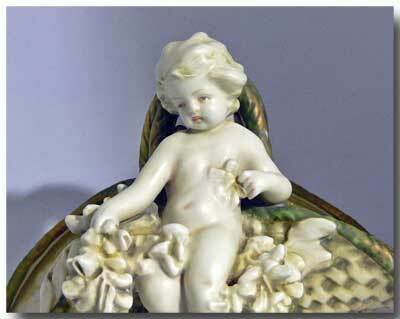 THE BASKET IS IN GREAT SHAPE AND THE APPLIED PUTTI & GARLAND IS VERY WELL-DEFINED (SEE FACIAL DETAIL). THERE ARE NO LOSSES, CRACKS, CHIPS OR REPAIRS. APPROX. 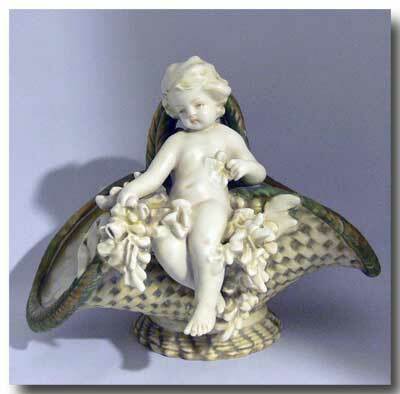 SIZE IN INCHES: 9” h. X 10 ¾” w. COLOURS ARE CREAM & GREEN WITH GOLD HIGHLIGHTS. CIRCA 1903-1910.